Do you sometimes wonder what exactly is going on behind our cool online shop? Are all our clothes really secondhand? Do we actually stand in a cold garden house for hours and print each piece individually? And which materials do we use? Through our activism in Fashion Revolution, we have become aware that many of these questions are unanswered and we are far from being a transparent project. With the following blogposts we will try to create clarity. It will be honest and detailed. If you have any remaining questions, message us. We want you to know what's going on behind rioots. The journey of every rioots shirt begins at a flea market. Right? No, of course not. Our shirts, like the majority of all garments, are usually produced on the other side of the world under conditions that are harmful to humans and the environment. So how is our project any better? The basic idea of rioots is to boycott the miserable means of producing our clothes. We want to create awareness of how our consumption shapes the world in which we live. As long as we demand cheap fashion, it will continue to be produced prioritizing profits. If we are not willing to pay the true price for our clothes, other people and the environment must do so for us. Even more, we want to show how much clothing already exists and what potential it has. We therefore find it absurd that so many social and ecological resources continue to be wasted on the production of cheap clothes. Rioots opposes fast fashion. We get our clothes and fabrics from flea markets, second-hand shops and donations. We find most of our clothes in person. In order to save transport costs and packaging material, we have decided to only use online flea markets for customized orders. We also purchased our screen printing equipment new. In retrospect, it would probably have been possible to find this used at some flea market or on eBay. Of course the production of such things needs a lot of energy and resources as well. But also in the future we will need new screens, paint and more. We will do our best to buy all these materials second hand as well. Especially with paint, this might be difficult, but you never know. By the way: more detailed information about the composition of the materials will follow. The tiedye for our cool tiedye shirts were also new purchases. But at least we used the same dyes over and over again for 2 years. When we have used them up, we will switch completely to natural dyes like turmeric. 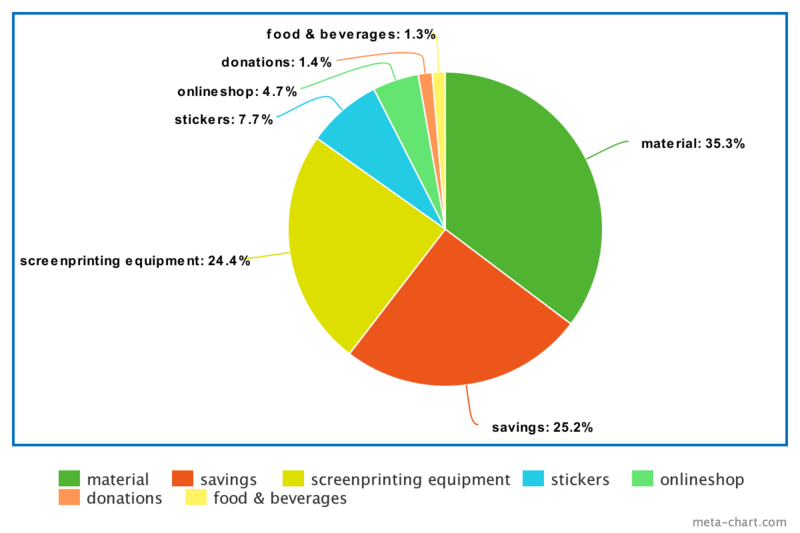 As you can see, we spend most of our income on materials (clothing, fabrics, yarn) and the screen printing equipment. We don't have a salary (yet? ); all our income goes through Felix back to the project/company. A minimal part is used for food and beverages, for example when we cater our models and ourselves, present our project somewhere or similar. Additionally to our expenses, we also make sure to have some project savings. Yes yes yeees! Even though we are not professional bloggers, we thought that would be a good thing. This way you can stay up to date away from Facebook and Instagram. It's also a nice place to report about news from us or tips and information in general from time to time. We are already thinking of something good for the first posts, so stay tuned! As always we are looking forward to feedback and comments and hope you liked that (no thumb, but for real).